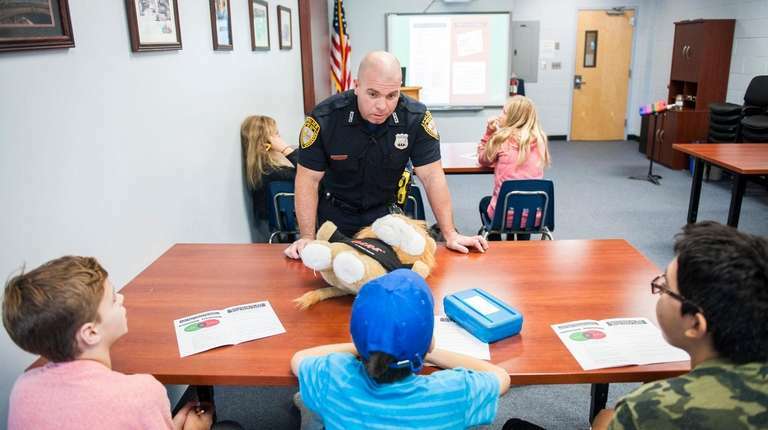 Shelter Island's school district has become the first in the state to roll out a new D.A.R.E. program. Other districts are expected to follow. The Shelter Island school district is the first in the state to roll out a new D.A.R.E. program aimed at combating the growing opioid epidemic, and other districts across the Island and state are looking to follow. “It could happen anywhere, so why not give our kids all the protection, all the information, all the preventative dialogues they can have with other people, so that when they’re faced with this they know what to do," Shelter Island schools Superintendent Christine Finn said. If the program prevents one person from overdosing, it will be a success, she said. 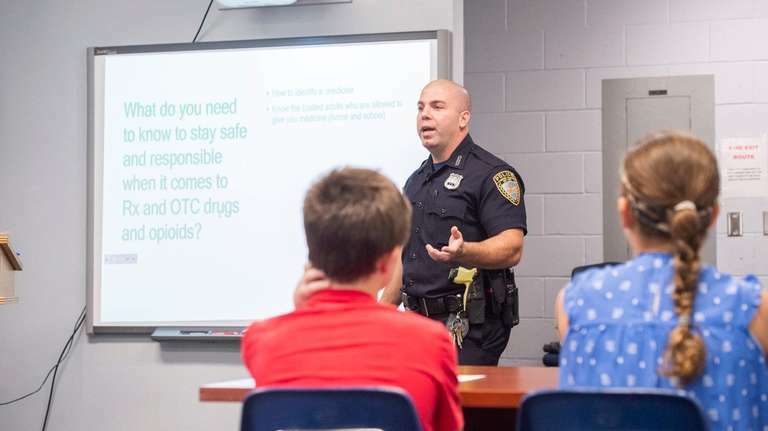 The D.A.R.E., or Drug Abuse Resistance Education, curriculum includes a series of police-led lessons focusing on opioid and over-the-counter and prescription drug abuse prevention. 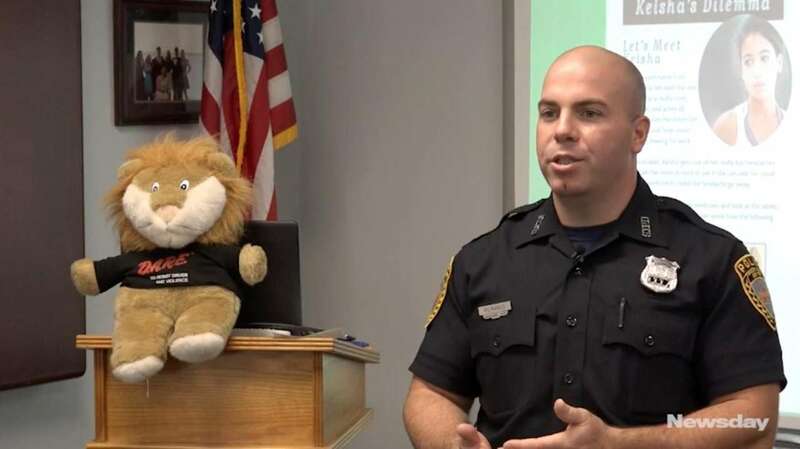 Rando is one of 2,000 officers nationwide who has been trained in the new curriculum, and began teaching it to seventh-graders in mid-October. “Growing up, I’ve known people that have abused medication. Being a police officer, I’ve revived people using nasal Narcan and I know it’s a big problem here,” Rando said. There were 555 deaths related to opioids in 2016 — 195 in Nassau County and 360 in Suffolk County, according to data from both county medical examiner’s offices. School districts across the state and Island have responded to the epidemic, with some, including Shelter Island, stocking Naloxone in school buildings. Commonly known as Narcan, it binds opioid receptors in the brain to block the effect of drugs such as heroin. D.A.R.E. was founded in 1983 in Los Angeles and has continued to evolve, in 2017 developing its newest curriculum, D.A.R.E. America Northeast regional director Mark Medford said. The D.A.R.E. program is 10 weeks, he said, and the new curriculum is an additional two 45-minute lessons. The curriculum was developed by the D.A.R.E. America Scientific Advisory Board and its training and curriculum committee, which consists of experts in prevention education, medicine and addiction. It’s to be used as a supplement to D.A.R.E.’s lessons that focus on providing students with the skills to make responsible decisions when faced with high-risk behaviors that include substance abuse, violence, bullying and internet safety, Medford said. The lessons for middle-schoolers teach the difference between over-the-counter and prescription medication, how to read prescription labels, the dangers of misusing medications, and introduces them to the opioid epidemic. The elementary program focuses on who to call in case of an emergency and what’s safe to touch, smell and eat. The high school lessons go deeper into the relationship between prescription drug abuse, opioid drug abuse and heroin. There’s also a presentation for parents and the community. “It just keeps getting more and more impactful based on the age group,” Medford said. The curriculum is being rolled out nationwide, and the first trainings will take place for D.A.R.E. officers in New York State on Nov. 8-9. “I know how important it is. I know how it impacts our community, so I wanted to get ahead of it right away, as soon as possible,” said Rando, who was contacted by one of the D.A.R.E. America educators and asked to be the first in the state to roll out the seventh-grade lessons. The program costs the police department about $5,000 annually, but the new curriculum is no additional cost other than supplies, Read said. Sitting with the 11 other seventh-graders in her Shelter Island classroom Oct. 16, Kaitlyn Gulluscio, 12, learned the difference between over-the-counter medication and those prescribed by a doctor. “If I get hurt and I need to take prescription medicine, I know who to call now in case I don’t know how to take it, and I’ll need to know how much to take,” she said. Gulluscio had D.A.R.E. with Rando in the fifth grade, and said she recognizes the importance of the lessons he teaches. “If we don’t know like how much these drugs could hurt us, we could get hurt by it and possibly die,” she said. 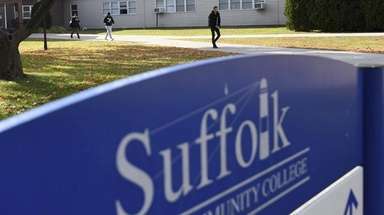 Other districts and law enforcement agencies on the Island, including Southampton Village police and Our Lady of the Hamptons Regional Catholic School, said they are looking into the program. Sister Kathryn Schlueter, principal of the regional Catholic school, said they are going to use the curriculum starting with the sixth-grade program. She also hopes to host a parent presentation. “This is a serious epidemic that’s coming into our community. You’ve got to head it off,” she said. Opioids were involved in 42,249 overdose deaths in 2016, according to the latest data from the Centers for Disease Control and Prevention. Drug overdoses accounted for 3,638 deaths in New York State in 2016, up more than 32 percent from 2015, according to the CDC. 46,373 students are receiving D.A.R.E. About 25 percent of school districts in the state offer D.A.R.E.